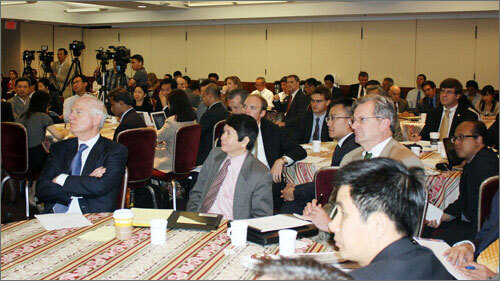 VietNamNet Bridge - The US-based Center for Strategic and International Studies (CSIS) organized a conference on maritime security in the East Sea in Washington, USA, on June 20-21, in the context of escalating tension in this area. The event was attended by world leading researchers on the East Sea and around 80 high-ranking officials, policy makers, and representatives of the media. Vietnamese representatives at the conference were Dr.Tran Truong Thuy, director of the East Sea research program, lawyer Nguyen Duy Chien and Dr. Dang Dinh Quy, director of the Institute for International Relations. The conference focused on issues related to sovereignty, territorial disputes, regional stability, freedom of international navigation and exploitation of under sea natural resources. Attendants focused their discussions on four major topics: interests and positions of parties in the East Sea; recent developments in the East Sea; the effectiveness of the current frameworks and mechanisms for maritime security in the East Sea; and recommendations for policies to enhance security in the region. In the first day, international scholars made presentations and discussed the interests and the role of parties in the East Sea, as well as recent developments in this area. 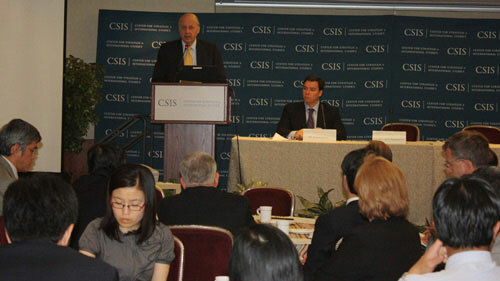 On the second day, US Senator John McCain delivered the keynote speech. The conference was held before the ASEAN Regional Forum (ARF) in July and the East Asia Summit (EAS) in October in Indonesia. Many international scholars opposed China’s arguments on “historical basis” of the U-shaped line in the 2-day conference in Washington. After Prof. Su Hao from the China Foreign Affairs University in Beijing delivered a speech on China’s sovereignty and policy in the East Sea, Dr. Termsak Chalermpalanupap, Assistant Director for Program Coordination and External Relations of the ASEAN Secretariat, said: “I don’t think that the 1982 United Nations Convention on the Law of the Sea (UNCLOS) recognizes history as the basis to make sovereignty claims”. Prof. Peter Dutton from the US Naval University did not agree with China’s explanation of the meaning of the U-shaped line related to history. He said: “The jurisdiction over waters does not have connection to history. It must observe the UNCLOS”. Dr. Dutton stressed that using history to explain sovereignty erodes the rules of the UNCLOS. World famous researcher, Carl Thayer, Emeritus Professor of Politics, the University of New South Wales at the Australian Defense Force Academy, said that Chinese scholars using historical heritage to explain its claim of sovereignty once again shows the lack of legal foundation under the international law for the claim. Caitlyn Antrim, Executive Director, Rule of Law Committee for the Oceans of the USA, confirmed that the U-shaped line has no ground under the international law because historical basis is very weak. She said: “I don’t understand what China claims for in that U-shaped line. If they claim sovereignty over islands inside that line, the question is whether they are able to prove their sovereignty over these islands. If China claimed sovereignty over these islands 500 years ago and then they did not perform their sovereignty, their claim of sovereignty becomes very weak. For inhabited islands, they can only claim for territorial waters, not exclusive economic zones from the islands”. Dr. Bonnie Glaser from the US, Dr. Tran Truong Thuy from Vietnam, Prof. Carl Thayer from Australia and Ian Storey from Singapore talked about recent developments in the East Sea and their explanations for these incidents. The US must help Southeast Asian countries build up naval defenses to counter “aggressive” Chinese actions in the East Sea, Senator John McCain said in his key note speech on the second day of the conference in Washington. The US should aid the 10-member Association of Southeast Asian Nations (ASEAN) to “build up their maritime defense and detection capabilities to develop and deploy basic systems such as early- warning radar and coastal security vessels,” he said. Tensions in the disputed waters have increased over the past month as the Philippines and Vietnam said Chinese ships had harassed their oil and gas survey vessels. McCain, an Arizona Republican and ranking member of the Senate Armed Forces Committee, said “the aggressive behavior of China and the unsubstantiated territorial claims that it seeks to advance” are “exacerbating tensions” in the waters. “The events now unfolding in the East Sea will play a decisive role in shaping the development of the Asia-Pacific region in this century,” he said. Earlier, senators Jim Webb, a Virginia Democrat and a former Secretary of the Navy, and James Inhofe, an Oklahoma Republican, submitted a resolution on June 13, condemning what they described as “the use of force” by Chinese vessels. The US, which has patrolled Asia-Pacific waters since World War II, has defense treaties with the Philippines and Thailand, and guarantees Taiwan’s security. The US Navy has said it will conduct joint training exercises with both the Philippines and Vietnam over the next two months.